Detritus? You probably don’t use such a fancy, highbrow word, but that’s the name for the muck, slime, and rotting stuff that tends to accumulate at the bottom of your Fort Meyers pool. Detritus is usually black or brown, and if your pool is left to itself, detritus will accumulate just like it tends to do in every body of standing water in Florida. But just why is it a bad idea to allow detritus to gain a foothold in your pool? In this blog post, we’ll look at the reasons why you should fight the battle against pool detritus, and some strategies to win against it. 1) It doesn’t look nice in your pool. Even though this is just an aesthetic reason, the look of your pool plays a big part in whether or not it seems like an inviting place to swim. Just think of the difference between bright, sparkling blue water and the greenish-brown tint of a pool that hasn’t been cleaned very well. Whether you’re the only one who ever uses your pool or your pool is the constant hangout for your kids and all their friends, no one wants to invite detritus to the party. However, it is a persistent uninvited guest, as detritus is always being made from the plant matter that drops into your pool. 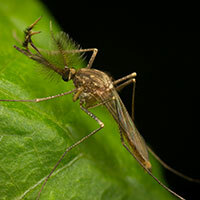 2) It harbors midge fly larvae. Detritus is a food source for midge fly larvae, and if you have enough detritus, your pool can become host to these larvae. They will cover themselves with detritus, making themselves almost invisible and creating a kind of protective sack for themselves. It’s bad enough to think of your toes sinking into slimy brown detritus, but to think that there might be a squishy brown worm-like larva down there makes the thought even worse. Detritus is covered with bacteria. Many different species of bacteria live off of detritus, and their main job is often to process the rotting organic matter, decomposing it. While your pool chemicals are meant to kill the bacteria in your water, having an abundant source of food can cause these bacteria to be able to survive longer and even reproduce. When you start to notice detritus in your pool, you’ll quickly discover that it’s almost impossible to eliminate it with chemicals alone. The only foolproof strategy against detritus is good old elbow grease in the form of brushing, skimming, and scrubbing your pool tiles. This process can be exhausting, as it can take hours to fully eliminate established detritus from your pool. Rather than spend your summer days scrubbing detritus out of your pool, why not have the friendly pool experts at Grand Slam Pools do it for you? We are very familiar with the best ways to get rid of detritus and make your pool an inhospitable place for it to take hold again moving forward. In our Full-Service package with weekly vacuuming, we’ll not only do the right amount of scrubbing for your pool to keep detritus away, we’ll also give you a weekly vacuum to make sure that your pool is detritus-free and sparkling clear. Call us today to get your first pool cleaning service set up anywhere in the Fort Myers area, and get your first two weeks free!